Beth decided to help us out by cooking us a delicious Glazed Roast Chicken with all the trimmings courtesy of Tesco. “Did you know that your region’s favourite family dish is the British classic, the roast dinner?” Tesco asked. Good choice Newcastle. Nowt better than a roast dinner (I was a little disappointed that pizza made the top 5, but relieved that a Greggs sausage roll did not). In honour of this Tesco has shared their “fantastic Sunday roast recipe” with us so we could join them in celebrating this British classic. The expectations of their recipe were high. They came out with promises of “the perfect mix of flavours”, “heart-warming chicken” a “treat for the whole family”. Bold indeed. As a recipient of many a top quality Sunday roasts, this certainly had a lot to live up to. 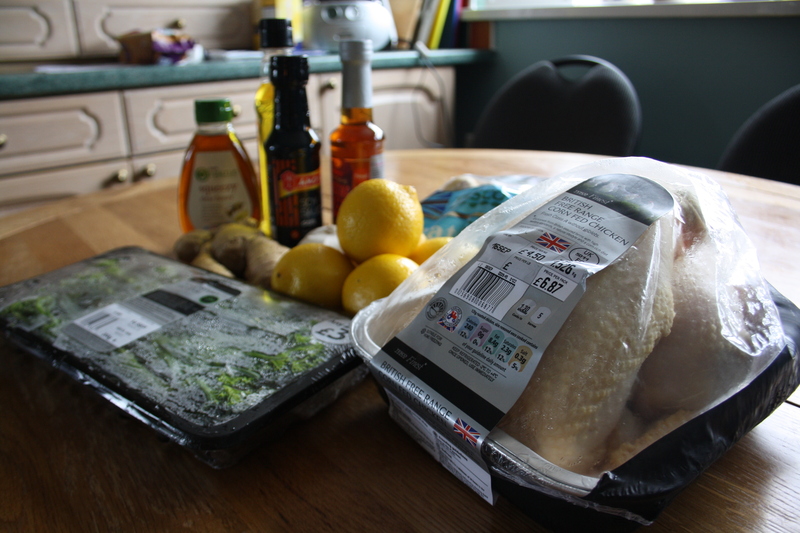 On a Tuesday morning a delivery arrived from Tesco with all of the ingredients needed to create this much anticipated Sunday roast. I excitedly tied my long hair into a top-knot, put on my apron and washed my hands, pretended I was doing the technical challenge of the Great British Bake Off (Mary Berry is one of my all time heroes. She should be yours too). The recipe which was provided was very clear and simple to follow. 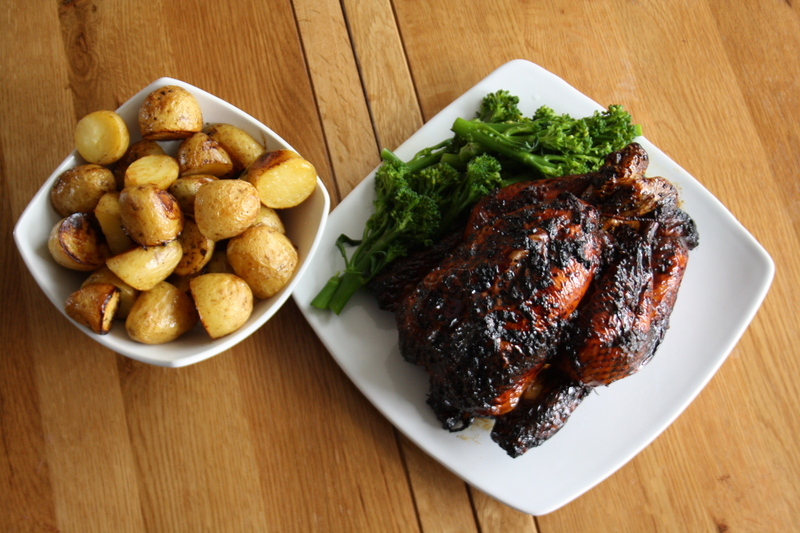 There were three main aspects to consider: The chicken, potatoes and broccoli. If I was making this again, which I’m sure I will be doing, I would branch out and add some more vegetables, such as the humble carrot. However, these three entities did very well in the creation of a very well rounded meal. After preheating the oven, I tackled the glaze for the chicken which had an oriental twist. 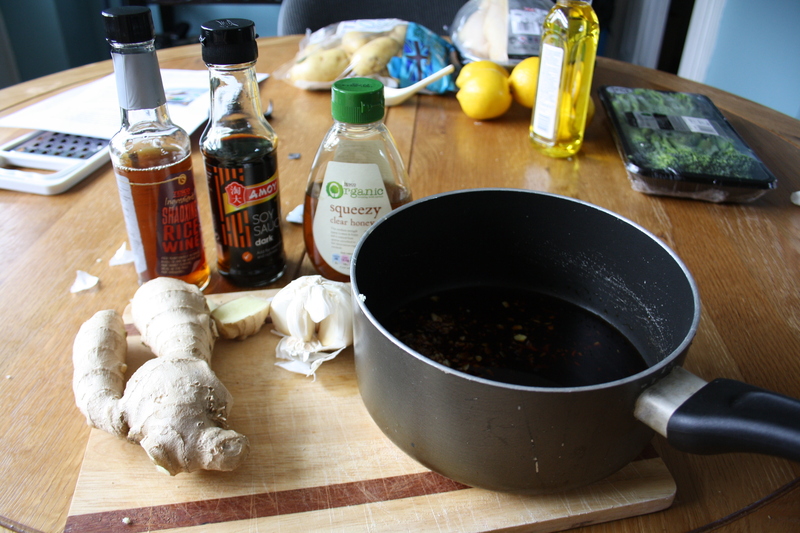 It included, honey, soy sauce, root-ginger (one of my favourite things), garlic and a cheeky splash of rice wine. The components boiled together to form a thick and sticky pan of aromatic deliciousness. After using half of the glaze to coat the naked chicken, I popped it in the oven for 50 minutes. The potatoes were probably my favourite thing about this recipe; they were so easy to do but tasted like you had spent your whole life trying to impress someone. That good. I just halved the charlotte potatoes, threw them in a roasting tray with slices of lemon, a little salt, pepper and olive oil. Once the chicken had cooked for 50 minutes I spread over the rest of the glaze and put it, with the potatoes, back in the oven for a further 30 minutes. Very simple! 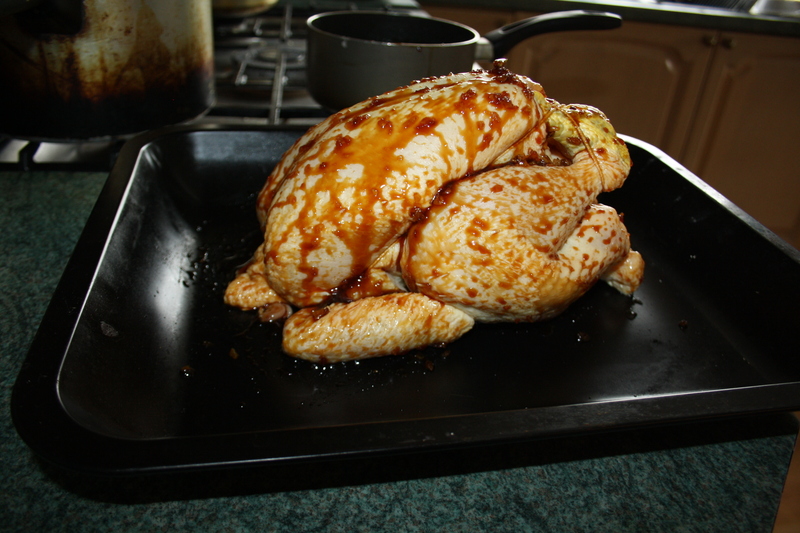 The glaze of the chicken was getting rather dark and I had a bit of a panic thinking that it might be getting burnt, I even considered arming myself with kitchen foil and jumping in to rescue the poor chicken. However, as any Great British Bake Off fan knows, you do not change the recipe/ method of the technical challenge. Biting my lip I refrained from any alterations and submitted to Tesco, the only comfort being that the image which I was provided with looked much like the image that was appearing in my oven…and boy did it smell good! The boiling broccoli did not present with any challenges, which is always a bonus. After the chicken had rested, it was time to plate up and tuck in! If you’re stuck in a rut with your roast dinners, I completely, utterly, wholeheartedly, unreservedly recommend this recipe which assuredly is a “treat for the whole family”. Once you’ve tried it you’ll want to share it too! Thank you Tesco! Every little does help. 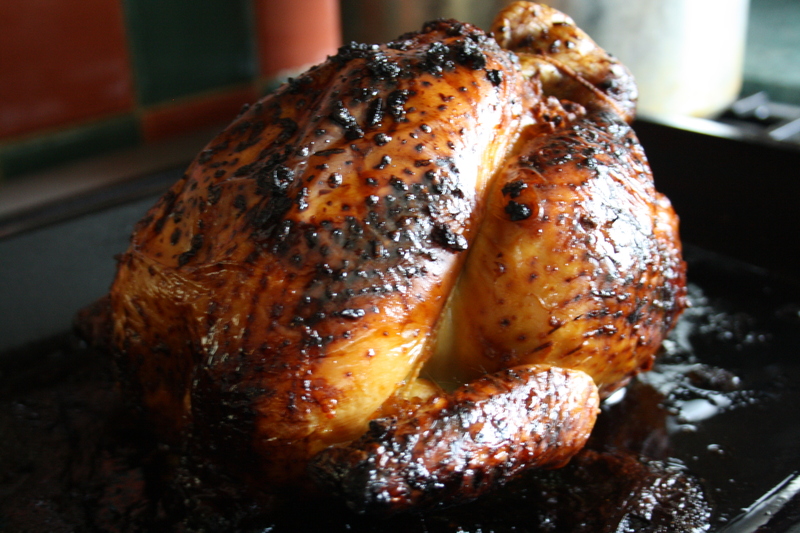 See the recipe below for the Glazed Roasted Chicken, and share your experience online using #LoveEveryMouthful. Preheat the oven to gas 6, 200˚C, 180˚C fan. 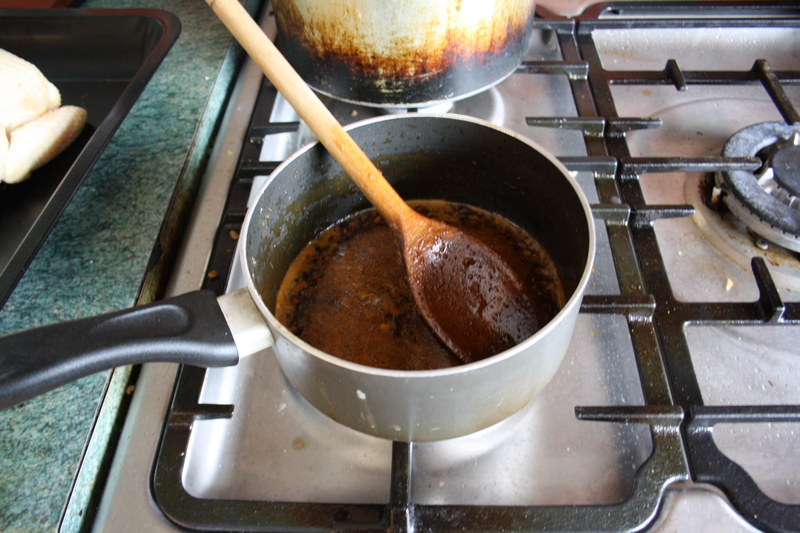 Combine the honey, soy, ginger and rice wine in a pan. Boil for 5 minutes until thick and sticky. 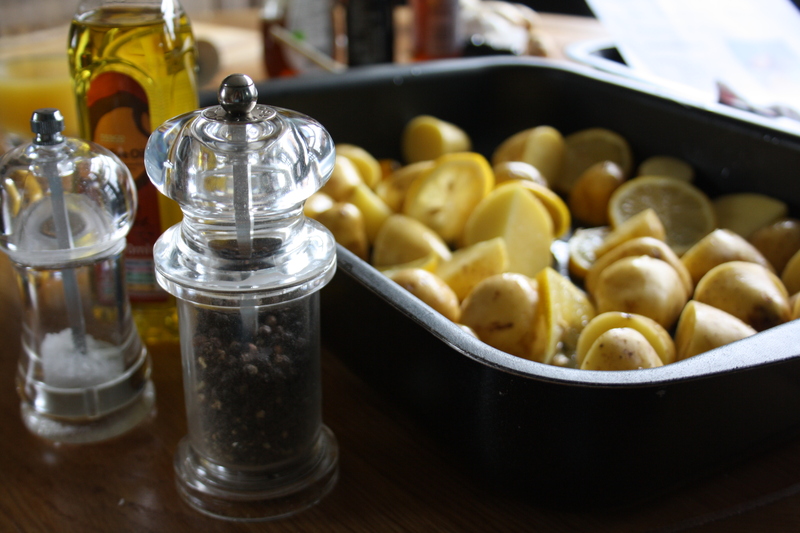 In a roasting tin, toss the potatoes with lemon slices, oil and seasoning. Put in the oven for the last 30 minutes of the cooking time. 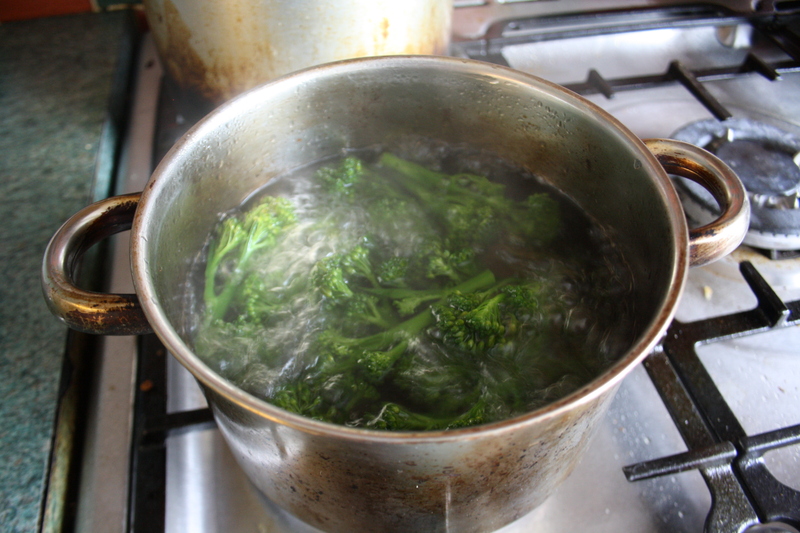 Boil the broccoli for 3 minutes, serve with chicken and potatoes.